The Outwell Fibreglass Pole Kit Set is universal for most types of dome or tunnel tents. As fibreglass poles for any manufacturer are not covered under a standard warranty, it is essential that spare poles are taken on any camping trip as the great British weather is unpredictable at best! This set of tent poles will make up a total length of 4 metres and includes 7 Tent poles with ferrules, 1 pole with 2 spigots and 400 cm of elastic shock cord. Please note, do not shorten any section by more than 10cm as this may affect the flexibility. Extremely fast shipping overseas, excellent item and service, could not be better, thanks ! 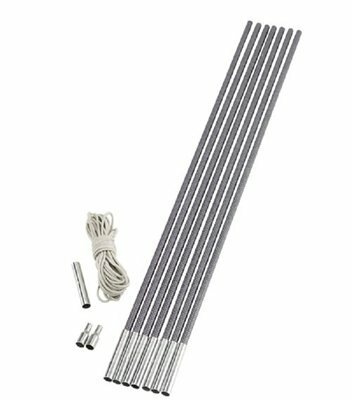 Good spare pole kit for me!